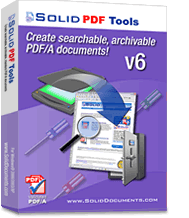 Solid PDF Creator Plus v6 now includes the ability for users to specify options for creating structured PDF files from Microsoft® Word documents and other popular Office applications. Hyperlinks - All hyperlinks can be carried over to the new PDF file, or they can be omitted. Bookmarks - PDF Outline bookmarks can be created according to the logical structure of the original document. Document Information - Document Summary details in the original document can be used for the Document Information in the new PDF file. 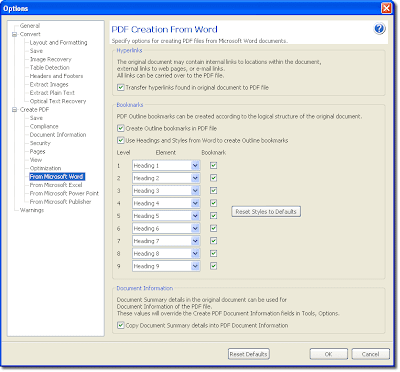 PDF Creation From Word dialog screen. Click to view full size image. 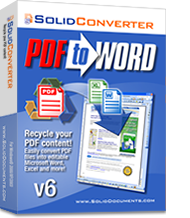 Solid Converter PDF v6 and Solid PDF Tools v6 also include these same options for creating structured PDF documents. With the improvements to our PDF/A technology, we believe version 6 is now one of the best PDF/A tools availabe on the market today. This PDF/A functionality is also available to both .NET and C++ developers through our Solid Framework SDK product. • Extract tables from PDFs directly into an Excel worksheet with a single click. • Quickly extract vector and bitmap images from your PDF documents. Using Shift+Click or Ctrl+Click, select the desired pages in your PDF.